We’d love your help. Let us know what’s wrong with this preview of The Unwanted by Michael Dobbs. In October 1940 the Gestapo expelled 6,504 Jews from southwest Germany, creating the first official "Jewish free zone" in the Third Reich. Interned in concentration camps in Vichy France, the deportees set out on a multi-year quest to acquire American visas. One in four eventually managed to gain entry to the U.S. or to other foreign countries; the remainder perished in French camps or, later, in Auschwitz. In October 1940 the Gestapo expelled 6,504 Jews from southwest Germany, creating the first official "Jewish free zone" in the Third Reich. Interned in concentration camps in France, the deportees set out on a multi-year quest to acquire American visas. One in four eventually managed to gain entry to the U.S. or to other foreign countries; the remainder perished in French camps or, later, in Auschwitz. To ask other readers questions about The Unwanted, please sign up. If you are (as I am) a person of a certain age, with a certain family background, and a certain intellectual predisposition, you will doubtless have read numerous books about the Holocaust. I have, and each one... I don't want to say 'each one teaches me' because 'teach' is most certainly not the right word. I'm not sure the word even exists for an event of this magnitude and significance. I've been avoiding Holocaust related books of late (the book I recently reviewed about Elie Wiesel notwiths If you are (as I am) a person of a certain age, with a certain family background, and a certain intellectual predisposition, you will doubtless have read numerous books about the Holocaust. I have, and each one... I don't want to say 'each one teaches me' because 'teach' is most certainly not the right word. I'm not sure the word even exists for an event of this magnitude and significance. I've been avoiding Holocaust related books of late (the book I recently reviewed about Elie Wiesel notwithstanding). But this new book is by Michael Dobbs, whose work I've admired for many years, beginning when he worked for the Washington Post. I don't know that "The Unwanted" breaks new ground but it definitely brings a very powerful immediacy to its subject. The book alternates between the experiences of Jews living in the German village of Kippenheim and what was taking place on the global stage, in Washington and Berlin, Marseilles and Havana. Thus we read of the inexorable erosion of Jews' civil rights, Kristallnacht, the abortive journey of the St. Louis, the strangled immigration quotas set by the United States, international negotiations, etc., but we also watch as these things are being lived through by a group of ordinary people. We of course know the awful larger outcome of these events, but "The Unwanted" enables us to witness these things being played out on a small stage peopled by men, women, and children who now have names and faces: how they are forced to respond as all of their possessions are abruptly taken from them, as they desperately seek to get their children out of Germany, to leave Germany themselves, to survive in one camp or another. At this granular level, the challenges we watch them try to navigate are alternately harrowing, infuriating, and heartbreaking. And the suspense we feel as we read is real. Dobbs is, as always, an exceptional -- and exceptionally gracious -- writer. At the end of "The Unwanted" he talks about what motivated him to write the book, but I can't help but feel that behind every word is a keen awareness to our current situation. He never brings any of today's events up, but he doesn't have to, does he? It's clear enough in passages like this: In a Senate speech, [North Carolina senator Robert] Reynolds claimed that "Nazi and Communist agents" had infiltrated "every boatload of refugees" arriving in American ports. The only way to stop America becoming "a cesspool of revolutionary activities" was to erect an impenetrable barrier. "If I had my way," the Senator thundered, I would today build a wall about the United States so high and so secure that not a single alien or foreign refugee from any country upon the face of the earth could possibly scale or ascend it." Historian Michael Dobb's new book, "The Unwanted: America, Auschwitz, and a Village Caught In Between", is one of the best works of non-fiction I've read in a while. Dobbs writes about the fight to get Jewish refugees into the United States in the years right before WW2 (and extending into 1941), using the plight of Jews from the small German village of Kippenheim as they realised what was happening to them. Kippenheim is located in the German area of Baden. It's not far from the French/German bo Historian Michael Dobb's new book, "The Unwanted: America, Auschwitz, and a Village Caught In Between", is one of the best works of non-fiction I've read in a while. Dobbs writes about the fight to get Jewish refugees into the United States in the years right before WW2 (and extending into 1941), using the plight of Jews from the small German village of Kippenheim as they realised what was happening to them. Dobbs details three or four families from the village and the attempts they made to "get out". Many were successful and were able to leave before and slightly after the breakout of war on September 3, 1939. But most of the remaining Jews were sent to Gurs - a holding camp in the southwest part of France. From there, attempts by United States charities and government entities to save these few thousands of German Jews ( including Kippenheim's contingent) and send them to safety in the US or Mexico or Martinique. By concentrating on the fates of a hundred or so German Jews in the morass of Gurs and Marseilles, and interspersing the activities being carried on by the US to both save them from being "sent East" OR foil that attempt because of prejudice by some American officials, Michael Dobbs has delivered a dandy of a book. He's an incredibly smooth writer and he seems to know that readers appreciate maps and pictures and charts because he includes them in the text. His story of the village of Kippenheim is complete when he looks at the village today. Michael Dobbs does and excellent job bring the people in this history to life in the most heart-wrenching and fact based way. Questions I had about where the western powers were and what they were doing to help alleviate the suffering of Jews on the European continent were thoroughly answered. And, it made me reconsider my thoughts on many of the moving historical pieces from that period. Definitely worth the read. He’s an excellent writer of nonfiction. A detailed but readable history of two intertwined threads of the holocaust. 1. The vivid stories of the Jews of Oppenheimer, Germany __ their suffering, strength, and perseverance. 2.The response of the American bureaucracy, government, and people during this period. Xenophobia, antisemitism, political exigency, and fear of foreign subversives led to a severe limitation of visas when a piece of paper meant life or death. 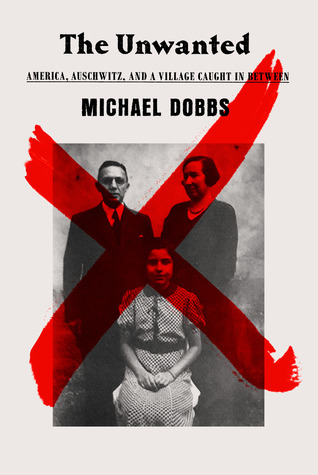 Although Dobbs does not draw an explicit link to the current political situ A detailed but readable history of two intertwined threads of the holocaust. Michael Dobbs was, almost literally, a child of the Cold War. His diplomat parents whisked him off to Russia at the age of six weeks. As a child, he lived through the Soviet invasions of Hungary and Czechoslovakia, and the construction of the Berlin wall. As a reporter for the Washington Post, he witnessed the birth of the Solidarity movement in Poland, the hope and tragedy of Tiananmen Square, th Michael Dobbs was, almost literally, a child of the Cold War. His diplomat parents whisked him off to Russia at the age of six weeks. As a child, he lived through the Soviet invasions of Hungary and Czechoslovakia, and the construction of the Berlin wall. As a reporter for the Washington Post, he witnessed the birth of the Solidarity movement in Poland, the hope and tragedy of Tiananmen Square, the breakup of the Soviet Union, and the war in the former Yugoslavia.